We took the bus to Phnom Penh, which was not as bad as I’d feared but not as good as I’d hoped. In the pictures provided by the travel agency the bus looked quite luxurious, with seats that recline all the way down into beds and a shiny new toilet in the back. It was all lies. But the ride was smooth and it was very interesting to see how things suddenly change once you cross the border. It was like going back in time. 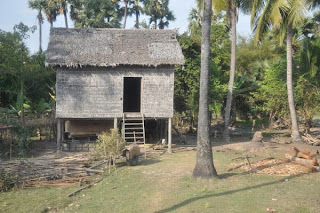 Most of Cambodia is very rural, with people working manually in the rice fields, living in wooden huts on stilts with no elecricity. A common means of transportation is a cart driven by oxen. Another thing I noticed immediately is how less populated the country is, which I guess has to do with its sad past. Perhaps in part because Cambodia is poorer and less crowded, the scenery is much nicer than in Vietnam, which always has the roadside jumble of concrete mess and motorbikes everywhere. Phnom Penh is a pleasant city compared to Ho Chi Minh: less traffic, less chaos, fewer people, wider streets and sidewalks that you can actually walk on, and a nice riverside area. The first day we visited the museum and the royal palace, which made it clear that the cultural influences are Thailand and India. 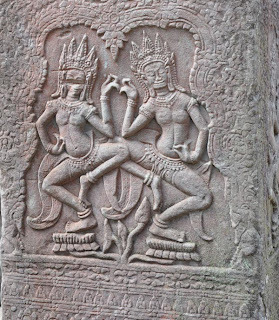 The temples have the same general style as Thai temples and the dominant decorative motif is the apsara, which is a surprisingly buxom nymph with her hands bend back impossi by far. Phnom Penh has two very distinct sides: on one hand, it seems an ex-pat paradise with a lot of great restaurants, wine bars, and shops that sell stylish, cheap clothes in Western sizes. But when you step out of that nice café you are confronted by a beggar with only one leg and arm – another landmine victim. Unlike here, the ex-pats really do live in another world. At least in Vietnam there are enough local people with money to enjoy the good restaurants and shops along with the ex-pats. 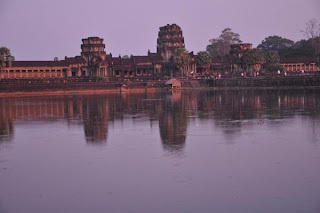 Of course Cambodia’s past is present everywhere. We went to the Killing Fields near Phnom Penh. It’s hard to find words to describe how overwhelmingly shocking, horrific and sad the place is. One thing that I’ll never forget is glancing down to see that I was not walking over stones in the path – at second glance I saw they were human bones. The bones and scraps of clothing are everywhere. The other thing I will always remember is the place where children were killed. It was so disturbing that I had nightmares that night. 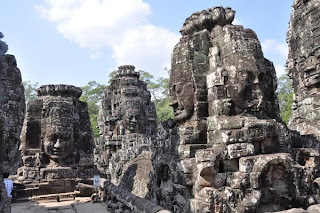 In contrast to the recent past, Cambodia’s ancient history is justifiably a great source of national pride. 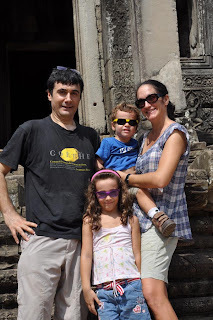 After Phnom Penh we went to Siem Reap, the town where Angkor Wat is. 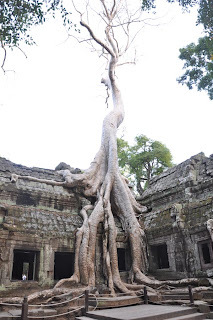 The temples surrounding the town are numerous and diverse, from the massive, well-preserved main temple of Angkor Wat to the falling-down jungle temples half-swallowed by giant vines to the perfectly preserved little boutique temple with intricately carved delicate decorations. I wasn’t sure if it would wor k out okay to go there with the kids, but it was in fact a great place to take them because you can run around freely in the temples. The minute we got to the one with the towers that have big Buddha heads on top, Francesco let go of my hand and started clambering through the dark passageways like a little Indian a Jones. We visited the temple where part of Lara Croft Tomb Raider was filmed. We got there at sunset as it was closing and the guards were chasing us out…the best way to see it! We visited a few temples further out of town, and I was somewhat alarmed to read a sign saying that the mine fielf in front of one of them was cleared in 2007. Needless to say we kept Francesco strapped into the stroller there. Since we’ve been home I’ve heard from friends about more interesting and beautiful places to see in Cambodia…so I have a feeling we’ll be back.